We are so blessed to have the opportunity to work with the kindest clients and love working with each and every one of them. We have really treasured the friendships we continue to cultivate even after their wedding or event. Here are some of the kind words they are saying about us. "I cannot express enough how thankful my husband and I are, for the time, energy and personal touch Ellaine of Premier Soirees put into each and every day leading up to, and of course the special day itself. Ellaine was recommended to us by another vendor we truly trust, and after my first meeting with Ellaine, all the hesitation of hiring a coordinator fell to the waste side. truth be told, I had 2 other coordinators lined up to meet with later that week, of which I immediately cancelled the next day as my heart was set on Ellaine. She's confident, polished, poised, and was personally invested in every aspect of our big day to ensure our happiness. She remained constantly in contact with me every step of the way, which only made me feel that much more relieved that we were in good hands. Ellaine finalized our day of itinerary, contacted and confirmed all my vendors prior to the big day, took care of all my last minute items, all the while dealt with family drama as it came and went. As many others before me, I have dreamed about our wedding since the day we said "I love you" and because of Ellaine and her ability to keep me at ease, we were able to live in the moment, and our wedding day was so much more than anything I could have ever dreamed of. Thank you so much from the bottom of our hearts! We would recommend you to anyone and everyone!!" "Ellaine and the Premier Soirees team are Amazing!! From the very beginning of our planning to the very end she made our special day perfect in every way! She listens to what you've been dreaming of and turns your day into even more than you can imagine! She pays close attention to detail, time efficient, makes every effort to work around your schedule, execution is on point, puts all your worries & stress on her plate. She was everything we could ever ask for in a planner. Her vendor recommendations were a perfect match for us. If you are a bride, who wants someone to make your wedding dream come true, then Ellaine is worth the investment. We are so happy to have had her as our planner. She took care of everything on our wedding day so that we can enjoy every moment spent with loved ones and dear friends. She's one of our dearest friends, you'll absolutely fall in love with her when you meet her! She's a DIY crafty planner and pays close attention to detail. If you want someone who has style, personality & patience then she's your wedding planner! We are so happy we were able to enjoy this special time and journey to plan our wedding with someone like Ellaine. Worth every penny, we love her!" "If you're looking for someone to truly make wedding planning easy, I suggest using Premier Soirees. Ellaine and her team were extremely helpful and took care of everything. On the day of my wedding I seriously didn't have to worry about anything. All I had to do was get ready and get to the church! Stressing on your day is the last thing you want to do and if you go with Ellaine you'll never have to worry. She was with us every step of the way and she had such great input. She really made our vision for our wedding come to life. Thank you Ellaine and team for everything!" "I would recommend Premier Soirees to all of my close family and friends with any of their most treasured events. Ellaine and her team were so attentive to detail, quick to respond, flexible &considerate of what was important to us. We would share our ideas and visions with Ellaine and she and her creative team would execute them above and beyond our expectations, while still being considerate of our budget and values. Ellaine and her team were able to create a tasteful, fun & memorable wedding for us that not only exuded our personalities and preferences, but also catered to and entertained our guests. Our guests still remark on how beautiful, fun and well-organized our wedding (and wedding shower) was even 2 years later! Equally outstanding was Ellaine's exceptional organizational skills. As a highly organized person myself who values ample time for preparation, excellent communication skills & practical applications of ideas, Ellaine was able to take on these responsibilities for me completely & perfectly - this was one of the best wedding gifts I received! She developed and reviewed a timeline of every single detail that would be occurring the day of our wedding and also made time prior to the big day to sit with us and discuss other acceptable options should any issues arise the day of, ensuring that we wouldn't be bothered with any hiccups. She coordinated with our vendors very clearly, and they remarked on how relieved they were to be working for someone who had so much experience in planning events seamlessly. Miraculously she anticipated and attended to the needs of us (bride & groom), our guests, AND our vendors! Ellaine and her team are definitely worth every penny!" "Ellaine and everything she has done. Ellaine went beyond her duties in everything we asked her help with. She recommended all the best people and helped ease our wedding stresses. Ellaine scheduled and attended all vendor appointments with us, responded to our emails when we had a question and effectively handled all follow-ups and details that we had either missed or not known about. She pulled everything together and turned our dream into reality!! No deed was too big for Ellaine to handle. Ellaine created a detailed day-of-the wedding timeline and everything ran 100% smooth and on time. Our wedding was a complete success! Most people have told us it was one of the best weddings they've ever been to. We are glad that everyone had such a great time - and we know it wouldn't have run as smoothly if we didn't hire Premier Soirees. As a bride and groom, we truly enjoyed our special day with friends and family. We owe Ellaine more than we can imagine. Truly an Unforgettable night!! We were taken care of from start to finish and we have Ellaine to be thankful for!!" "Ellaine was our Wedding Angel. Leading up to the wedding, she took care of the multiple vendors and helped with the details of the wedding. I was able to let go of all of the planning. I felt worry free, which is a great feeling during a time that can be very busy and stressful for many. She attended our ceremony rehearsal and her professionalism and calming nature assured me that I was in good hands and had nothing to worry about. On the wedding day, she took care of everything! Before the ceremony started; I was able to focus on myself and the girls in my bridal party without a single worry. The first time I walked out to see the wedding venue I was blown away. She did an amazing job setting up; it all looked so beautifully put together. The entire night ran according to the schedule thanks to Ellaine! She made the wedding day so smooth and easy. My husband and I had the best time taking in every moment and celebrating with our family and friends. If you want to really enjoy your wedding day and feel in peace that it will turn out even better than you imagined, hire Ellaine. She is wonderful and she will make your wedding day feel like the most perfect day ever." 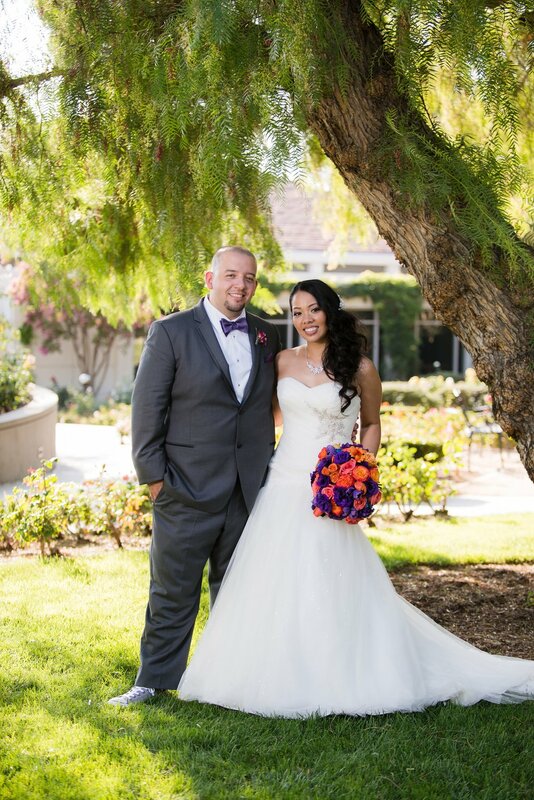 "Ellaine was the best wedding coordinator I could have ever had for our big day. She is the most genuinely nicest, sweetest person you will ever meet! We became great friends, almost family, and I'm truly grateful for that. From start of planning to the finish line, and even after, she was always on top of everything! Her creative, flexible, sweet, and accommodating personality really shined through and it made the whole planning process amazing, fun, exciting, and stress free! She was always so organized and efficient, I was so certain that the big day would have all aspects covered. Ellaine's goal is to truly make your dream wedding become a reality. So helpful, pleasant, and provided excellent customer service to us and each of our 260 guests! She really paid attention to the details and that was so important to me. Best of all, my family and everyone loved her! She knew exactly what we wanted and was always there when we needed her. Her professionalism is incredible and her skill set was so reassuring. Ellaine was always in communication with all my vendors and it made our wedding day the best it could be, especially because of the amazing timeline she produced. She goes above and beyond expectation. I will forever be grateful for Ellaine Calas for making our dream wedding as perfect as it was. We love you, Ellaine!!!" "Elaine and her team are the best! Our wedding was flawless. Me and my wife didn't have to worry about anything during the wedding and reception. They took care of everything. Even during the planning. Elaine was a very big help. We're so glad that we hired them. My suggestion to anyone considering hiring them, get the full package. It's worth it and more!" "Ellaine was marvelous! From the moment I met her I knew she was the right choice for us! She is so kind and professional and went above and beyond anything I could have ever dreamed of! Our wedding was a beautiful day and she executed it perfectly! I will never forget peering out of the limo window when me and my girls first arrived and that feeling of happiness that overwhelmed me with how incredible everything looked! She worked with us for over a year to make our dreams come true and communicated with us throughout the entire process. She gave me amazing advice and knew some great and competitive vendors. She had the same vision for the wedding and when we gave her the reins to piece it all together, it was unforgettable. Ellaine fulfilled every need and made the guests feel welcomed and comfortable. We will never forget our beautiful wedding day and working with Ellaine from Premier Soirees! We highly recommend her!